A majority of the provinces in the country of Canada have an agreement in place with the federal government (i.e. Canadian government) that allows them to nominate applicants who it deems suitable for its economy, etc. So, the first step in the provincial nomination program is to get/be nominated by the province. And but, each province nominates applicants/candidates based on it a) its immigration needs and b) its judgment about whether the applicant really intends to live there if selected by or under its permanent residency program. And of course, there are some basic and essential criteria that each province (different for each province) uses to decide who it would nominate (i.e. choose for nomination) to its province. There are also different categories and streams under which the applicant can apply for PR (Permanent Residency) and these are different from each other. Thus, some of the different ‘streams’ that the applicant can avail of are: for/by one-self, applying through an employer, self-employed farmer stream, etc. And also, there are different categories under each stream that an applicant under each of the PR (i.e. permanent residency) programs can apply through. 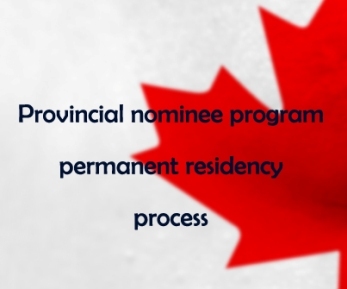 Also, even as there are eligibility criteria for being considered for the different provincial programs, there are also ineligibility criteria, under which, some persons are not eligible to apply for that provincial nominee program permanent residency. And then, if under the provincial nominee program the applicant is chosen (i.e. nominated), then the CIC (Citizenship and Immigration Canada) will further take up the application and make a decision regarding whether to award an applicant with the permanent residency status (immigration to Canada), or not.